Rarely do I have a desire for what is known as the San Diego Comic Con exclusive. This year there are 3 cool toys that I think action figure collectors(like myself)should know about. A recreation of the rarest of the Sears catalog exclusives: the 1982 & 1983 Missile Command Center. Why is it cool? When Sears commissioned a G.I. Joe exclusive from Hasbro, they essentially wanted 3 figures with something extra for the same price as 3 figures from Hasbro. At this time, Hasbro wasn’t sure that G.I. Joe would be a success as the toys still had yet to hit the shelves. For minimal cost(risk), Hasbro came up with the all cardboard play set. It has become one of the “Holy Grails” of G.I. Joe collecting and as it’s constructed from cardboard, very few have survived. Also, early versions of this set came with the “Mickey Mouse” Cobra Commander. The very early Cobra sigil was not as detailed, and it gave the insignia a resemblance to Mickey’s head, the very first run of Cobra Commanders came through like this. He was found in early mail aways and early releases of the set, making him one of the most valuable figures. 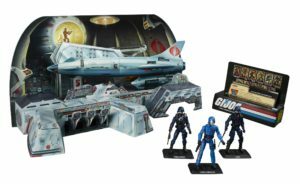 Hasbro has recreated that logo for the Cobra Commander in this set. So while the figures may just be repaints of earlier releases, the “Mickey Mouse” Cobra Commander and the fact that Hasbro went out of their way to do this again, is pretty neat. Attractively packaged is a good representation of what’s happening with Hasbro & IDW Publishing, and the shared universe that Hasbro is cultivating. Why is it cool? Well, aside from G.I. Joe and the Transformers, the other properties represented haven’t been made since the ’80s! Lets go over what’s in the box. First off is Transformer Jetfire. He’s a re-release from 2014’s Generations. He looks different than the original which was based off of Bandai’s Macross Super Valkyrie(Robotech Veritech). Transformed he won’t look as much like a bulky F-14 Tomcat. He’s the biggest of them all, but not so big that you can fit the 4″ figures in him and fly away. I’m still waiting for the transforming Sky Striker Hasbro! Next up representing G.I. Joe is Roadblock. He appears to be an all new sculpt. However, it’s based on his TV appearance in the G.I. Joe Renegades cartoon, rather than what is being offered in comic form, which is more in line with his traditional ’80s look. A little heavy with mutton chops does look a little more 2010 than 1984. 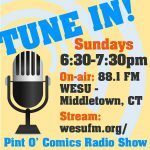 Third is Matt Trakker of M.A.S.K. This is a mostly reused mold from the 2008 Specialist Trakker G.I. Joe figure with a new head. Cool toy then, still cool now. Maybe we’ll get a 4″ RHINO or Thunderhawk? Following that up is ROM! I am super excited about this as the first ROM toy was from 1979 or 1980. He’s scaled a little small. The 4″ figures are 1:18 scale meaning they should be about 6′ tall in real life. ROM stands 7′ tall in the comics, so the figure should be about 4.7″, but close enough. ROM’s nemesis, the Dire Wraiths finally get their first toy! 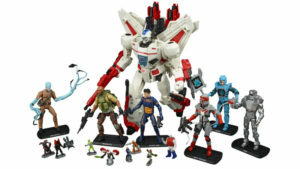 Made up for the Marvel comic book by Bill Mantlo, IDW has re-imagined them and Hasbro came up with a figure that uses some elements from the G.I. Joe line and definitely a new head. Great to get a creepy bad guy. Action Man Ian Noble is next. Action Man is Hasbro’s British G.I. Joe knockoff from the ’60s, if you’re unfamiliar with the brand. 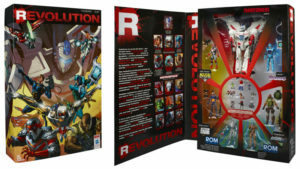 IDW gave Ian a 5 issue series, and is now one of the main characters in the Revolutionaries comic. The Micronauts are present in micro form! 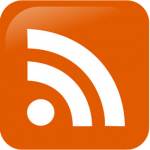 Acroyear, Baron Karza, Biotron and more. Really cool to be made smaller than the other figures. In the comics, these guys are supposed to be 3″-6″ tall. Obviously, because they’re so small, their statuettes like the little green army men that you get a 1000 of for a couple bucks. Awesome that they took time out to mold them and kudos for the scaling. Finally is Visionaries’ Leoric. Visionaries is a short lived toyline from 1986/1987 with a loyal fanbase that hasn’t been injected into the Hasbro / IDW universe as of yet. Maybe this is a glimpse of what is to come in the comics? This shared universe is also being planned as a movie franchise, so there’s possibilities there, too. 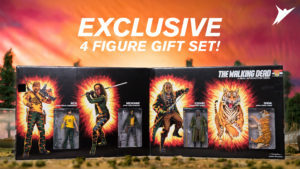 This set will be available in limited quantities after the show on HasbroToyShop.com, and judging by all the internet chatter on this set, this may be a hot one and bought up quick. 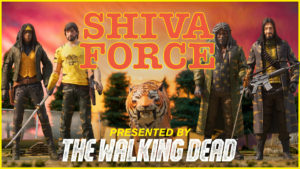 Finally is The Walking Dead’s Shiva Force. Skybound is releasing Rick Grimes, Michonne, Ezekial, and Shiva individually and as a boxed set as Shiva Force only at San Diego Comic Con. The boxed set is limited to 1000. There’s also a bloody variant set that is also limited to 1000. Jesus is only available through their Megabox subscription service. This is especially interesting because it echoes the G.I. Joe’s Tiger Force line from 1988, particularly in package art. I’ve always been a big fan of McFarlane toys and their attention to detail. Their NSFW children’s commercial(F Bomb warning) successfully sucked me in, too. So there you have it. A little something each for many people to collect, display, and hey, maybe even play with!